The JNLC was set up by the veteran fell runner himself in 1990. 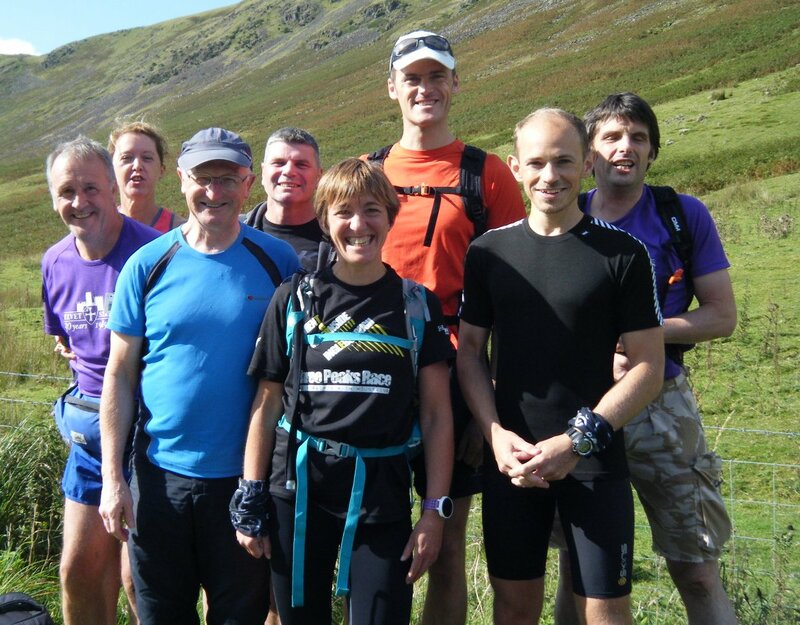 It is a self organised mountain challenge for veteran runners over 50. So there are no race organisers, no entry fees, no way markers, mile markers or fellow competitors. The time allowed increases with age and runners must be accompanied over the route. At age 60 I had 18 hours. 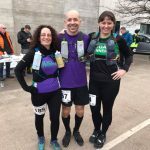 The course crosses the Lake District from Pooley Bridge, on Ullswater, to Joss’ home at Greendale in Wasdale – a distance of around 48 miles involving 17,000’ of ascent across 30 Lakeland peaks including High Street, Fairfield, Bow Fell, Great End, Great Gable, Pillar and Steeple. I chose to repeat the JNLC to mark my 60th birthday (I had completed the challenge 5 years earlier to celebrate my 55th birthday). An Achilles injury prevented the intended June crossing necessitating a postponement until September. A promising forecast heralded the intended day and a starry sky for the 5am start boded well. My support team on the first leg consisted of Paul Hainsworth, Katherine Davis, David Gibson, Mike Hughes and Aaron Gourley. They were there ready and waiting for me on the dark bridge at Pooley. Head torches were discarded before we reached the first top and dawn arrived as we traversed the grassy tops of Loadpot and Wether Hill. A beautiful blue sky was lit by a huge orange sun as it crept above Cross Fell. Small herds of deer scattered as we danced across the tussocks and stones towards High Street. It was great to be alive and to share this experience with attentive friends. The sun was well up by the time we reached Kirkstone and its brightness was allowing the late summer fells to appear at their best. Mark Davinson and Mike Bennett joined me for the second leg and their friendly chat made time pass quickly over the screes and on towards Fairfield where an abandoned tent was the only blemish on what was developing into a perfect morning. I descended carefully down the rocky, eroded path towards the base of Seat Sandal as I didn’t want to take a fall this early in the day. The temperature rose making it even more important to drink little and often and my old familiar kit was starting to get very sweaty! 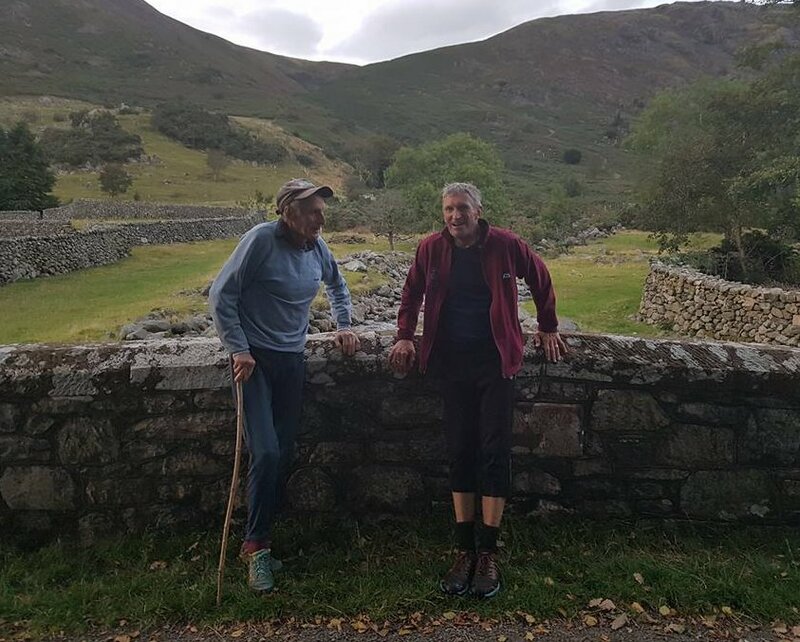 At a bright and sunny Dunmail Raise my road support team was waiting, headed by my wife Susan (another JNLC completer and to whom my most sincere gratitude goes), and including Graham Daglish, Heather Hughes and Jenny Wren. I was pleased to be over half an hour ahead of my sub 16 hour schedule here at the end of leg 2. A change of top and a little too much food consumed and it was off up the forbidding steepness of Steel Fell with my new support team of Scott Gibson, Paul Evans, Penny Browell & Rob Eaton. Scott, as navigator, ensured the best line was taken across one of my least favourite sections to High Raise. Clouds started to develop from here and so the heat was no longer a problem. However, the tops stayed clear and not a drop of rain fell all day. The food and drink consumed at Dumail was lying heavily in my stomach and it was sometime before I could manage anything else. This was disappointing as I like to ‘graze’ and so didn’t feel 100%. We continued to make up minutes here and there on the schedule as we traversed the rockier ground after Rossett Pike. The fells were packed today with holiday makers and charity walkers on the last weekend before the end of the school holidays. Nonetheless there were few people on the descent to Sty Head from Great End and we arrived there 42 minutes ahead of schedule. There were lots of my supporters here and it was nice to see old fell friends and other friends not known for their ‘fellgoing’ including Stan White, Aileen Scott, Alan Scott, Louise Billcliffe and Wendy Hughes. 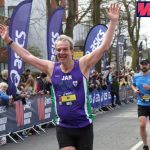 I was confident now that I would come in well under 18 hours but could I manage a sub 15 hour round? Time would tell. 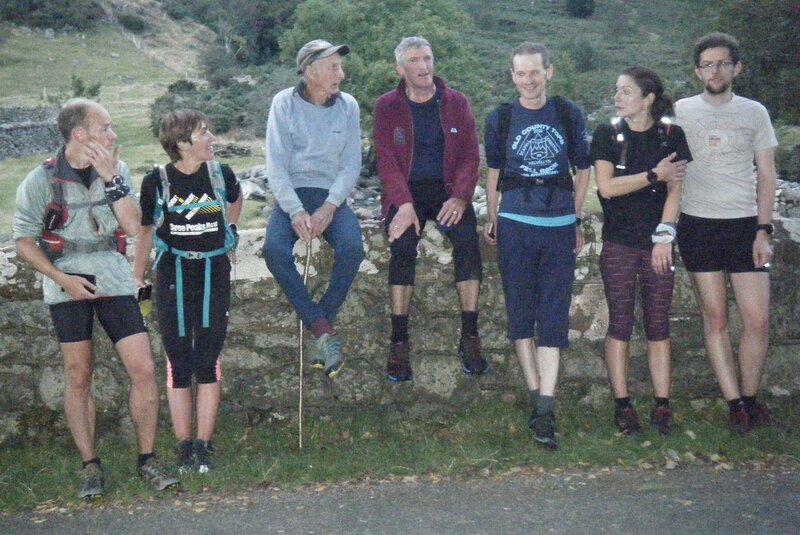 A steady climb up Great Gable was eased by my pacers’ conversations (John Duff, Elaine Bisson, Jack Lee plus Rob and Penny continuing for a second leg). A good line off the rocky top of Gable and fantastic views from Kirk Fell made everything a joy (well almost!). The cloud started to disperse and a welcome warmth returned making the usual slog across Pillar less of a trial. Steeple was fantastic with its lofty views and its heralding of the approaching finish. Some compass work off Haycock helped me find the scree shoot – a rocky escalator to the bottom! No time to empty stones from shoes as that sub 15 hour crossing started to beckon. 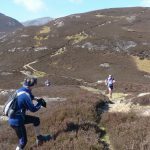 Only the steepness of Seatallan stood in my way and all those rocky miles already traversed were starting to take their toll. 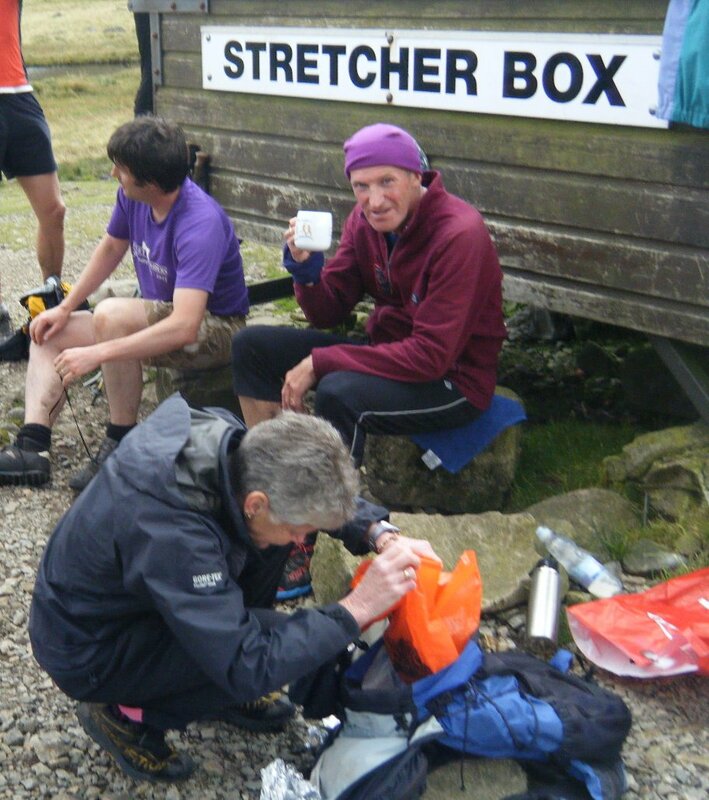 I had to stop a couple of times on the ascent but still got to the top within the scheduled time with the help of encouragement from my excellent pacers and nourishment from Kendal Mint Cake. Perhaps it was on? I still hadn’t fallen all day and managed to maintain this on the steep grassy descent of Seatallan. On reaching the final top of Middle Fell John told me “you’ve 27 minutes to get to the bridge if you want to get under 15 hours – easily doable for a man of your calibre!” And so it proved, as 19 minutes later I was shaking Joss Naylor’s hand on Greendale Bridge and enjoying the plaudits of my friends. What a fantastic day and what an honour to meet Joss Naylor once again. He was his usual gracious and humble self and happy to talk to anyone in our group. 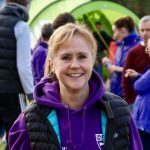 We chatted for some time not just about fell running, for which he retains a deeply felt appreciation, but about midges, house martins, swallows and his dog – which had ‘stolen’ a piece of Susan’s pie much to Joss’ consternation! 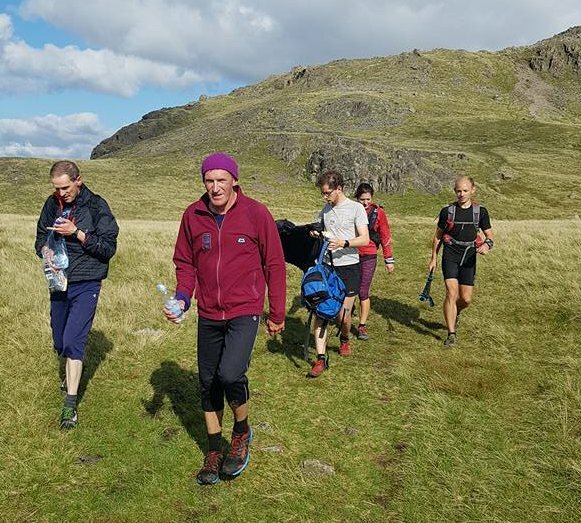 These fell challenges make for wonderful weekends but only happen after months of hard training over the fells and much meticulous preparation in terms of gathering a support team, preparing food and drink and devising a logistical time table. This can have its stresses but it also has its benefits in terms of long delightful days over the mountains with like-minded friends including those named above and others who were unable to be there on the day. I am very grateful to you all and hope you enjoyed it as much as you all seemed to do.